Ever since I made over the recipe for my Chocolate Crackle Slice, I’ve been a bit obsessed with rice bubbles. I don’t eat them for breakfast, I just like to bake with them, or rather not bake because lately it’s been way to hot to turn the oven on and our recent electricity bill made me feel quite faint. Let’s just say we’ve been using the air conditioning a lot! Since I’ve embraced minimalism, I’ve opted to share birthday experiences with my friends rather than give birthday gifts. 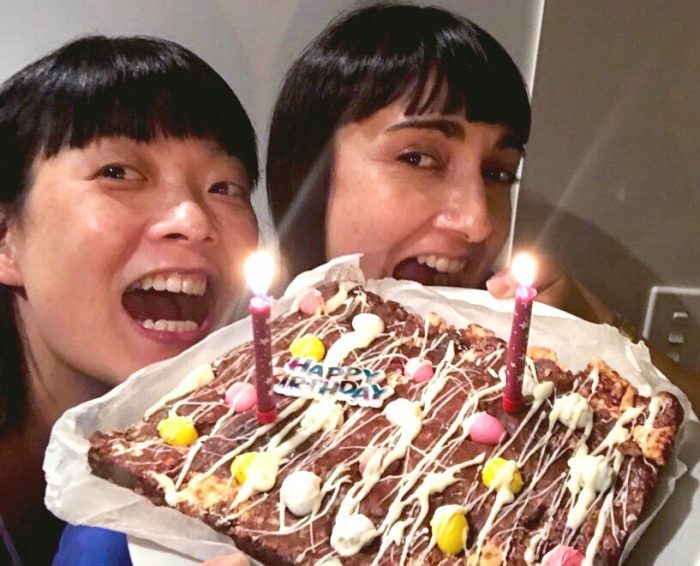 This year, we had an overdue birthday catch up with our dear friends Emily and Wen and in the spirit of minimalism and birthday bonhomie bought them dinner although there was nothing minimalist about the calories we consumed. Like Julia Child, I believe that a birthday gathering without cake is really just a meeting. I knew I had to take a cake for the gals but I wasn’t very organised, the sun was sizzling and I didn’t want to carry an enormous cake box across town. I decided on a no bake cake that could survive the cross city trek and when I say cross city trek, I mean a train ride. What’s a little hyperbole between friends? 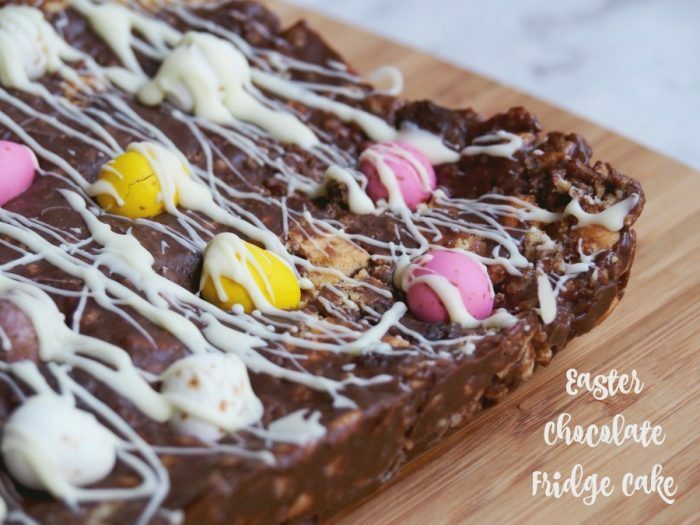 Anyhoo, this fridge cake ticks all the boxes, it’s quick, it’s easy and it’s very delicious. It’s also very sweet so a little goes a long way. 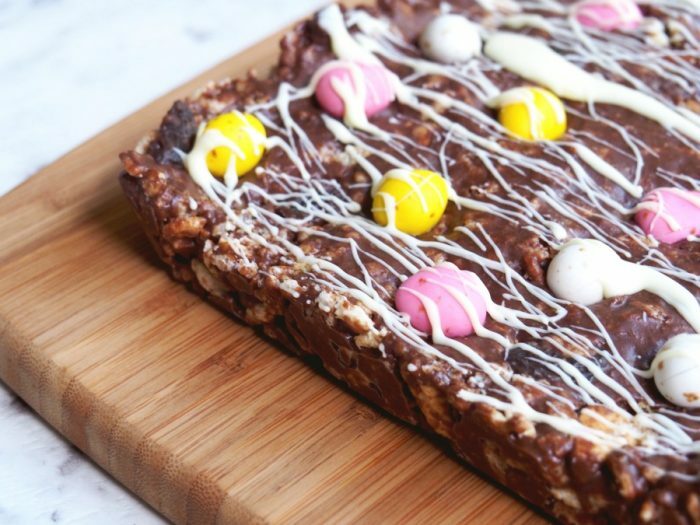 If a Chocolate Crackle Slice and a Rocky Road had a food baby, this would surely be it. 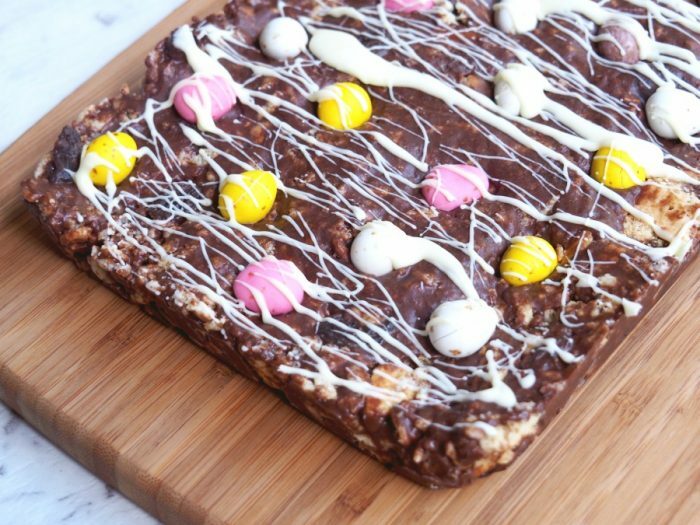 With the crisp rice bubbles, crunchy biscuits, rich chocolate and chewy sultanas, this no bake cake really is ridiculously good. If you don’t take my word for it, maybe you’ll take the birthday girls’! Now this recipe is very forgiving, I have at times used dark or milk chocolate for the cake and sometimes a combination of both. Of course, you can use any kind of chocolate drizzle on the top. I just like the contrast of the white chocolate plus I like to eat the left over bits of Milky Bar! 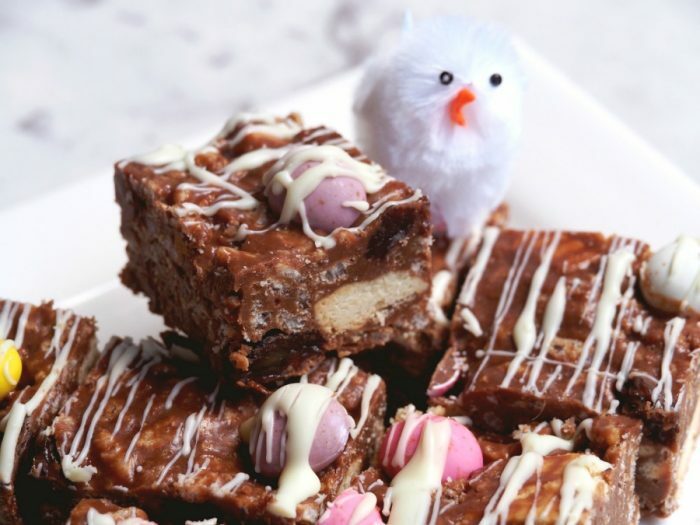 Any plain biscuits will do and you can swap out the sultanas for marshmallows if that’s more your jam. I’m lazy so I do melt the butter, syrup and chocolate in the Thermomix but I find my TM31 struggles too much when I add the rest of the ingredients, so I add the melted mixture to the dry stuff and mix in a large mixing bowl which saves my blades and strengthens my muscles! That said, this is such a doddle to throw together, even the kids can make it! The hardest part is waiting for it to set! 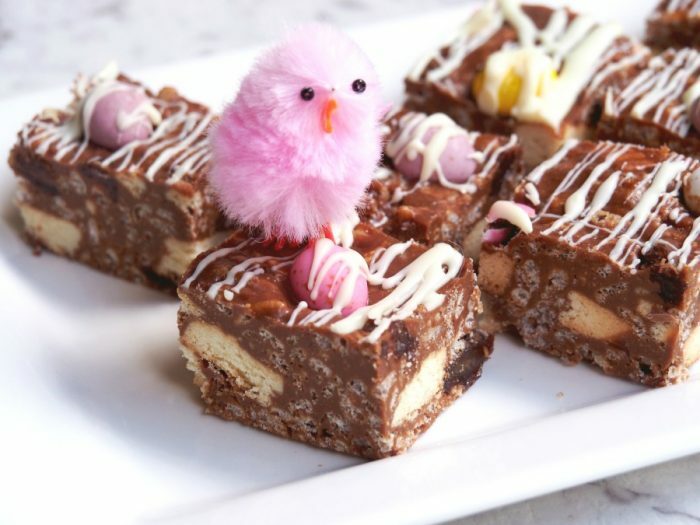 Of course, this slice is not just for Easter, it’s for all year round, just swap out the Mini Eggs for your favourite chocolate treat instead. The possibilities are endless! What’s the best birthday cake you have ever had? What’s your favourite chocolate – dark, milk or white? Grease 20cm x 30 cm (8 inch x 12 inch) rectangular pan, line base and long sides with baking paper. Melt the chocolate, butter and golden syrup in a bowl over a pan over simmering water, stirring occasionally until the chocolate has melted and the mixture is smooth and glossy. Add the vanilla, biscuits, rice bubbles and sultanas and fold in quickly but gently until everything is coated. Transfer the mixture into the prepared tray and press down with the back of a spoon. Press in the mini eggs. Refrigerate for 2 hours or until firm. 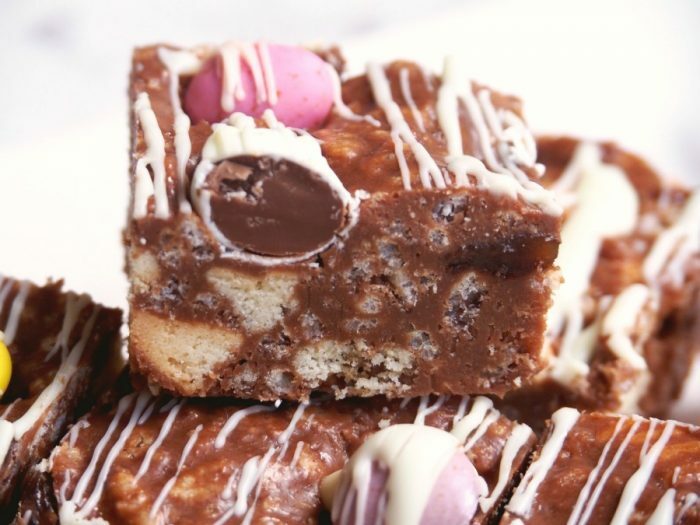 Using a teaspoon, drizzle the melted chocolate over the slice and cut into squares. Store slice in an airtight container for up to a week. Melt the chopped chocolate, butter and golden syrup in TM bowl for 3 minutes at 60 degrees on speed 2. In a large bowl, add the vanilla, rice bubbles , biscuits and sultanas. Pour over the melted chocolate mixture and fold in quickly but gently until everything is coated.